My opponent, the Stig (AKA my pal Damien) & I met for a show down on the desert sands of rural Queensland. A fair enough substitution for the Sudan. As true gentlemen, we diced to see who’d have which side. 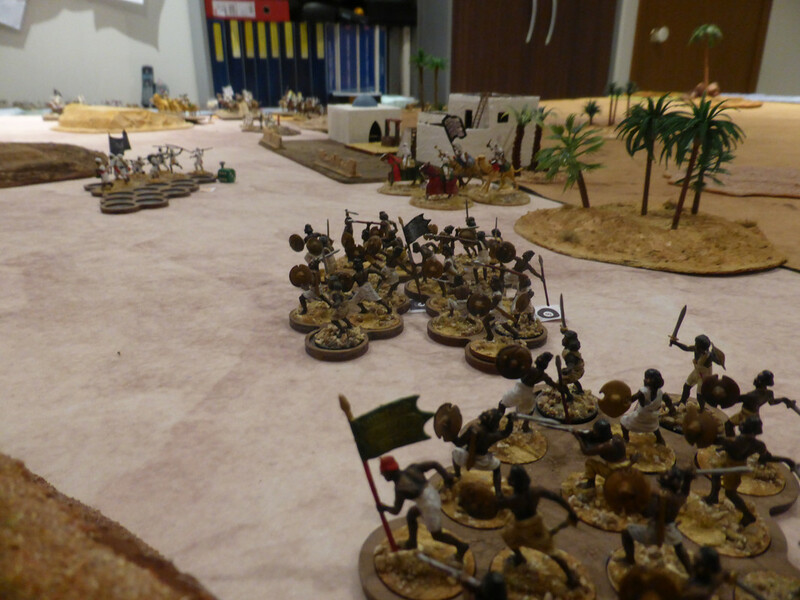 The result was Damien, stiff upper lip to the fore, served as commander of the Anglo-Egyptian Field Force, whilst I, the wily Khalifa, led the forces of the Mahdi. (note the Mahdist Leadership & the Hand of God). 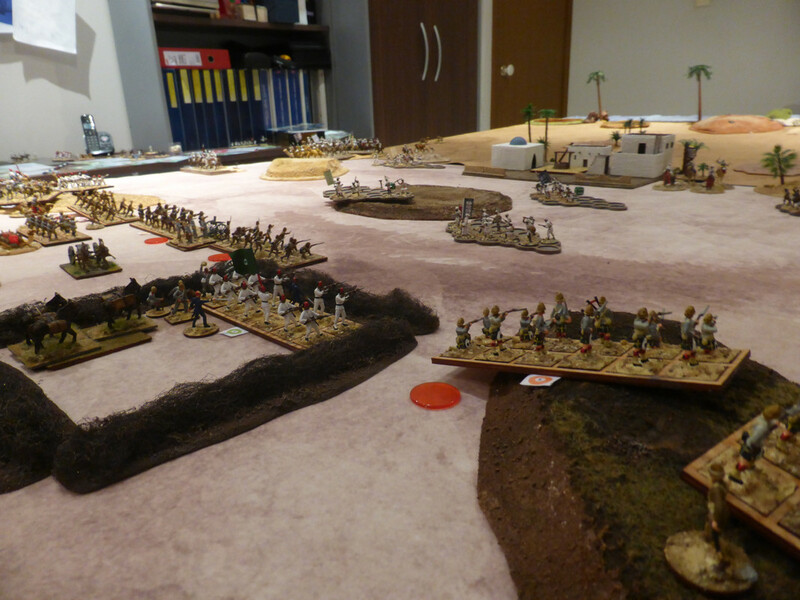 The battle was the largest we’ve ever gamed using ‘The Men Who Would Be Kings’ with 16 units a side. It was to be a simple encounter battle with the aim of destroying your foe. The only twist was the remote possibility of re-enforcements arriving from the Nile Squadron. Meanwhile, I awaited the (random) arrival of my hordes. The new Random Arrival Table works a treat in that no one (not even I) can tell what will arrive where & when. (the A-Es Standing To whilst about 75% of my force is yet to arrive). Despite some issues, I was able to marshal my army behind cover & in some strength, ready for a devastating charge. 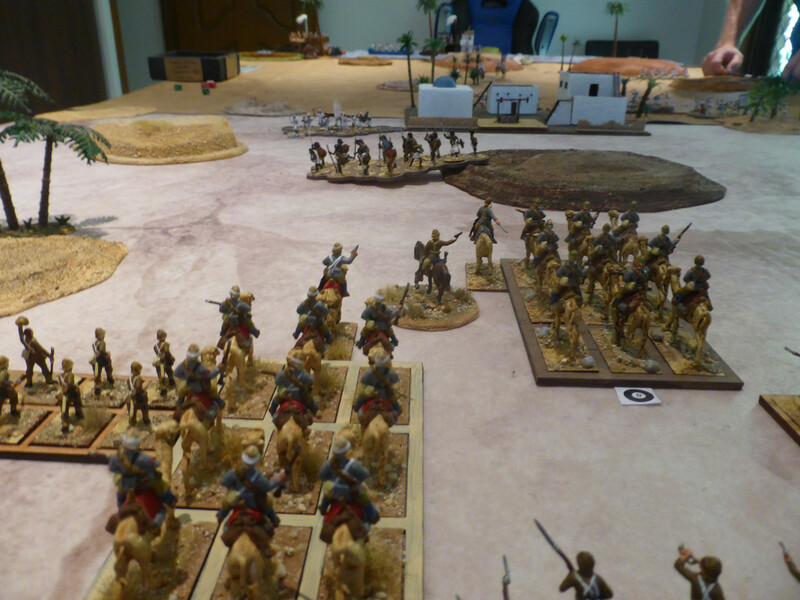 This was where the wheels fell off (‘nother Top Gear reference)……..
(One of my brave Dervish units....brave but wilful ). 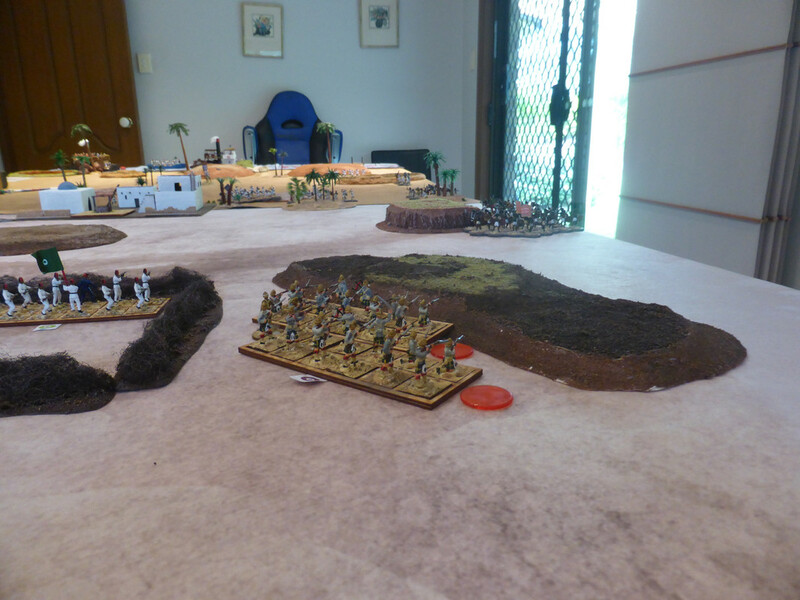 Key units failed to activate, charges fell short, a fairly accurate British fusillade caused units to be pinned etc. Indeed, as aggressive as I was, I could not mount a coherent attack & was largely shot up & let down. Fantastic looking game there. Thanks for bothering to post. Nice of you to notice. Thanks for the reply. No problem. We're *all* fans of 1/72 figures here. Ochoin wrote: We're *all* fans of 1/72 figures here. Splendid looking set up, pukka figures, right trim barkys and the British back in time for tiffin. I know wargaming and this forum aren't a great fit so I shouldn't get miffed at the lack of a reaction from the "Inner Circle". However, one does wonder why one bothers to post. I may not be in the "inner circle" but I loved the wargame pics. I wish I could see the figs a bit better with close-ups. Looks like some posts are missing here ... But, anyhow, really like the pictures! Nice big table and game, but a bit of a strange thread. Yesterday was holiday in many countries. Since spring is here (Europe) I suppose many members went outside with their families. So you shouldn't got upset for not getting replies in less than 24hrs. Maybe it is just my impression but I think that forum members are less active during weekends and holidays in general. 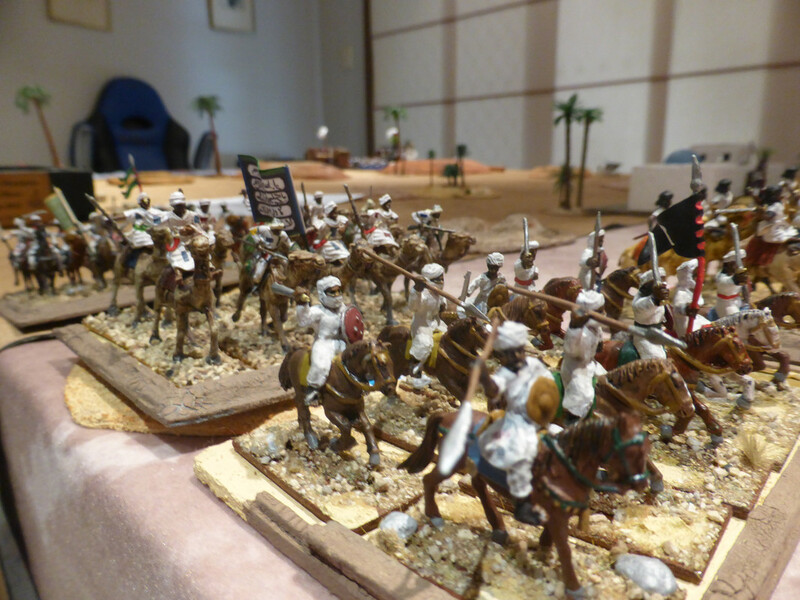 This great forum has always been a safe haven for all kind of 1/72 enthusiasts, quite many wargamers among them. Thanks to the mild moderation and the generally good atmosphere, none of the usual wargamers vs. dioramists flamewars or similar nonsense happens here. I totally fail to see a factual reason for discord seeking behaviour and passive-aggressive language. Even if the author feels his gaming report failed to gather enough praise, its still no reason to act like a huffy prima donna. Frankly spoken, too many once nice & active hobby forums were ruined because of capricious behaviour in the past. 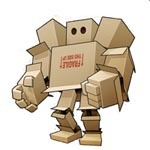 For what it's worth: wow, cute gaming report, magnifique, super toll... .
You need to get out more. You're talking to yourself. I don't feel overly "safe" with a post full of personal attacks like this one. The emoticons don't palliate the tone; indeed are patronising. Feeling like that Donald,why on earth did you post your topic here in the first place? I just arrived on line myself and noticed your topic on the day you posted it,and so therefore I am responding as I always do after seeing good stuff. 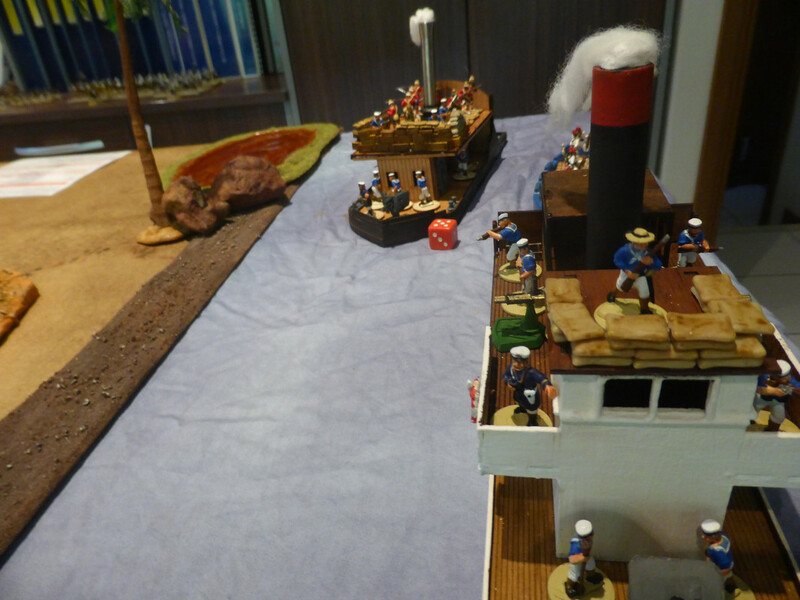 Such a good report on your game play,and dashing display of figures and the boats look brilliant too.The Photographs are also splendid. Let's all take a breath. 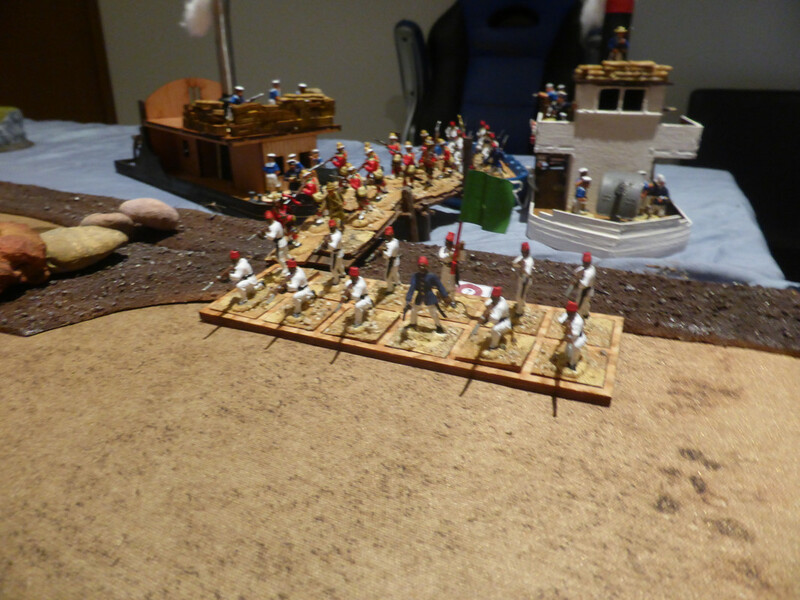 Ochoin was frustrated that he worked very hard to document his excellent wargame and got no response. I have been frustrated in similar fashion, so I can show him grace. I hope others will do so, too. Haven't seen any personal attacks, but I didn't see the posts you answer either. And since I don't wargame I probably don't see everything in the wargaming session of this forum. And as long as I get to see such nice figures as yours I am perfectly happy with that! Feel even a little inspired to dig up my old ESCI-Muslims and have a go at some of them! If no-one adds a Reply to a post, it doesn´t mean no-one has looked or has time to add a Reply. Getting impatient or whatever and "bumping", particularily in such a short time span, won´t necessarily illicit positive Responses..it could, as has can be seen, get negative ones. Picture links down. Image Host playing a Photobucket trick or? A few people have had trouble with Postimage lately. There are pics missing on an older thread I looked back at too.